ULA’s Atlas V rocket stood fully fueled atop its Cape Canaveral launch pad Thursday night, but was grounded late in the day’s countdown due to a technical issue holding up the planned liftoff with a $1.2 billion missile warning satellite and a wayward aircraft causing a violation on the Eastern Range in the last attempt to get the workhorse launcher off the ground. With no more time left in the day’s window, the United Launch Alliance Launch Team was forced to declare a launch scrub and set up for a 24-hour recycle. The next launch attempt will be made Friday night during a 40-minute window opening at 7:42 p.m. local time, 00:42 UTC on Saturday. Meteorologists have issued a 70% chance of cooperative weather with violations of the cumulus and thick cloud rules being the primary concerns. 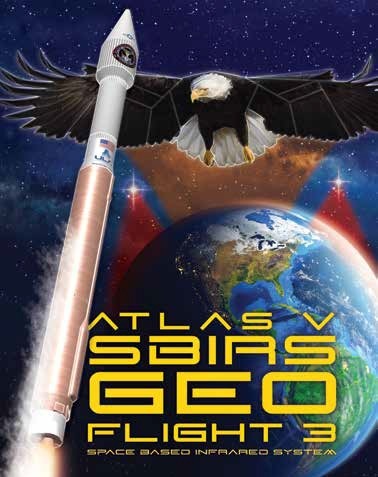 The year-opening mission of the Atlas V is tasked with carrying the SBIRS-GEO 3 early warning satellite into Geostationary Orbit for the U.S. Air Force. 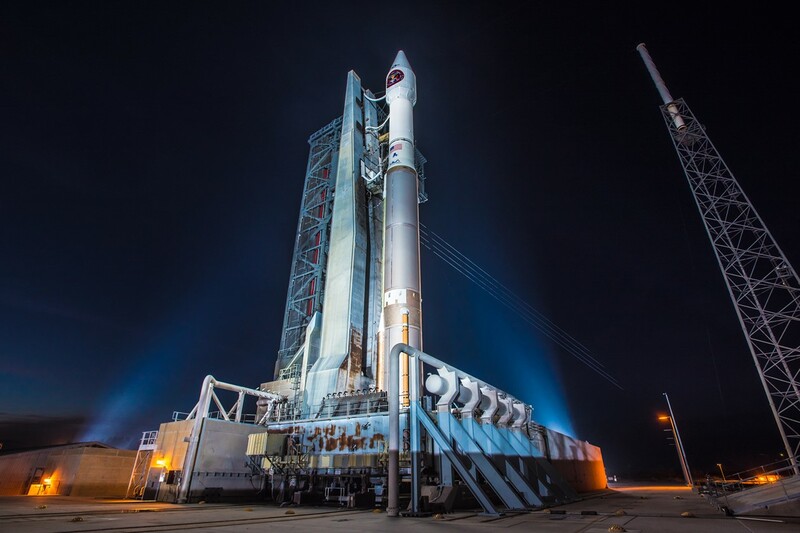 Thursday’s operation, for the most part of the day, ran like clockwork with Atlas V well behaved as it headed into a lengthy 7-hour countdown that started with the activation of the two-stage rocket for a multi-hour checkout campaign. 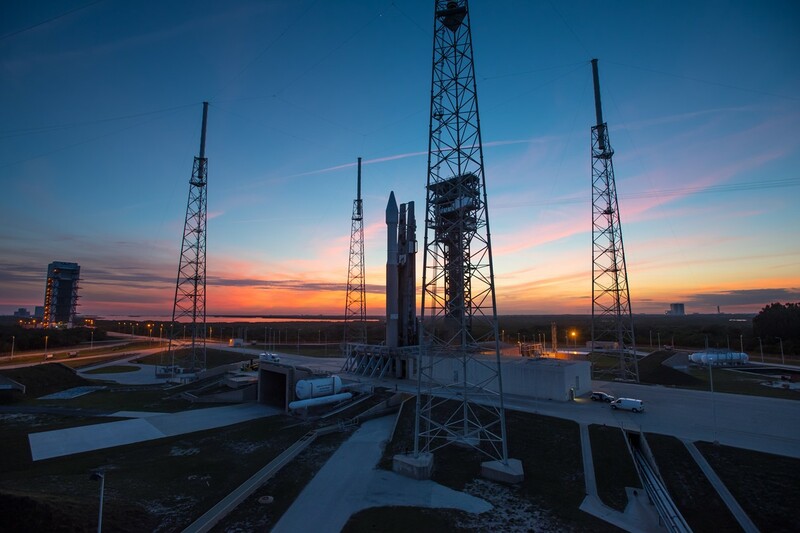 As the sun set upon Florida’s Space Coast, Atlas V headed into a busy tanking sequence as the countdown resumed at T-2 hours after a planned half-hour hold. 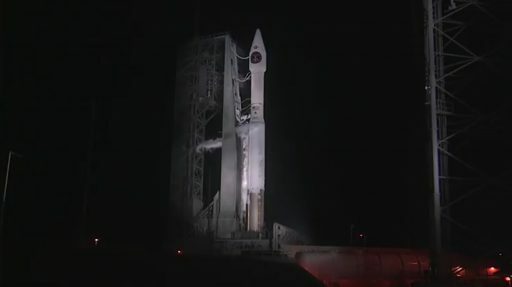 The propellant loading operation went by the book as Atlas V was filled up with supercold Liquid Oxygen and Liquid Hydrogen after the rocket’s first stage had already received its dose of Rocket Propellant 1 after Wednesday’s rollout to the launch pad. 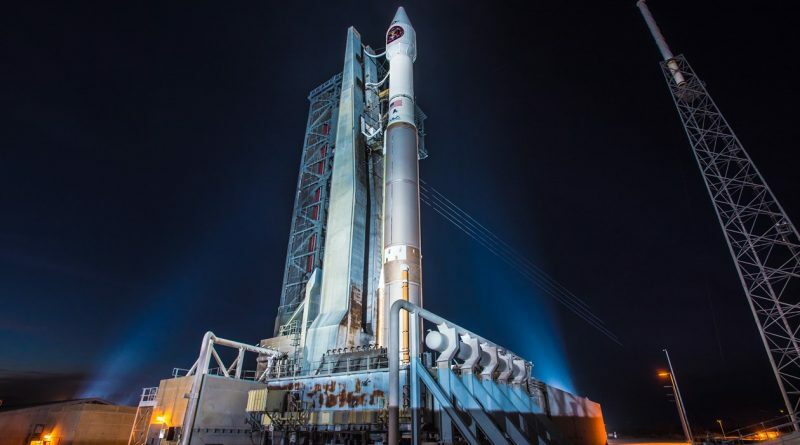 Illuminated by flood lights, Atlas V stood tall atop its launch pad as controllers worked through a repetition of tests before uploading the optimized flight software into the rocket’s computers to get ready for the fast-paced events of the Automated Countdown Sequence. 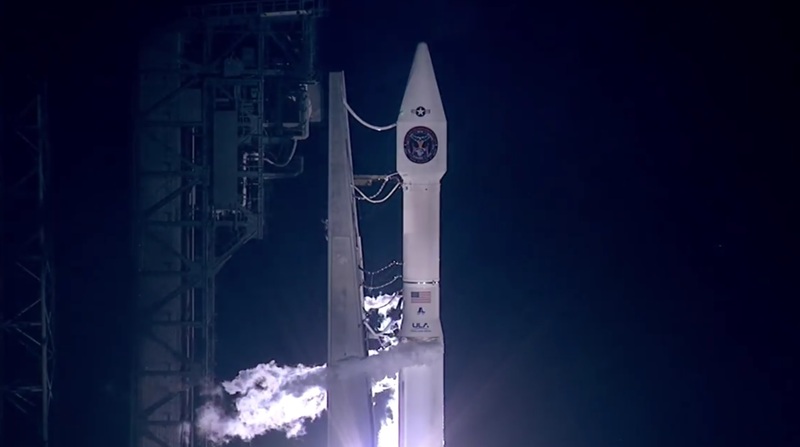 However, around half an hour prior to the opening of the day’s launch window, Atlas V encountered an issue when starting its fuel fill sequence. A pair of fuel line vacuum sensors on the RD-180 engine had stopped working and the launch team had lost insight into whether the critical priming of the engine’s fuel lines was being completed as commanded. The fuel lines of the two-chamber RD-180 engine are kept evacuated until filling with fuel in the last half hour to liftoff along with a small holding tank that provides the fuel needed in the engine’s ignition sequence. The engineering team at the Atlas Spaceflight Operations Center and at ULA’s Denver base spent around thirty minutes working out a workaround to gain insight into the fuel line status without the two failed sensors. A plan was devised to use alternate sensing equipment and data from the engine’s hotfire test in Russia to verify the signatures of a good filling sequence. T-0 had been pushed from an 0:46 UTC window open time to 1:16 UTC to allow for the Fuel Fill Sequence to be commanded followed by a check whether it was successfully completed. A poll of the launch team provided a GO for the 1:16 UTC liftoff with the exception of the propulsion team that was still verifying a good Fuel Fill Sequence. Consequently, T-0 was shifted to the end of the day’s window at 1:26 UTC and confirmation of readiness was provided by the PROP Team to allow the countdown to transition to automatic mode. Atlas V had just begun to check off its final pre-launch milestones when, at T-3 minutes and 26 seconds, the MFCO (Mission Flight Control Officer) called out the dreaded ‘Hold Hold Hold’ due to a violation on the eastern range when an airplane had entered a course taking it into the safety zone around the launch complex during the time of liftoff. The aircraft that intruded the Eastern Range was apparently registered by the Department of Homeland Security, according to online flight trackers. For every orbital launch from Cape Canaveral, designated Launch Hazard Area boundaries and air space closures are announced well in advance. Despite the published warnings, range intrusions of boats and aircraft have become a common occurrence, but are especially painful when taking a launch down to the wire to the end of the launch window. With the day’s countdown coming to a disappointing end, the Launch Team went through their procedure to first safe all systems on the Atlas V and then head into de-tanking of the launch vehicle. 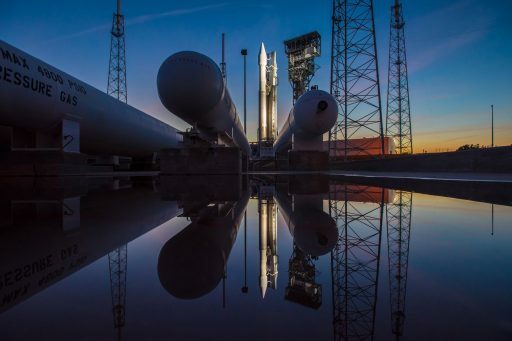 As part of the 24-hour turnaround, Atlas V will go through a new countdown sequence on Friday, setting up for a window extending from 00:42 to 01:22 UTC. The window time moves a few minutes with each subsequent day due to the orbital requirements of the SBIRS-GEO 3 satellite, aiming for a specific right ascension of the ascending node, RAAN in rocket terminology. ULA has requested Saturday as a backup launch date should Atlas V remain on the ground Friday night. 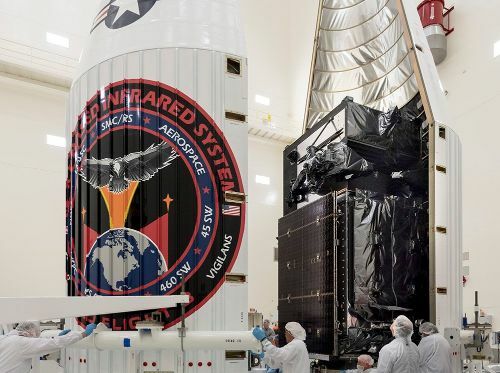 Shrouded inside the payload fairing of the 59-meter tall rocket is the third satellite in the U.S. Air Force’s Space-Based Infrared System, considered one of the Pentagon’s most critical missions, providing early warning of missile attacks anywhere in the world. 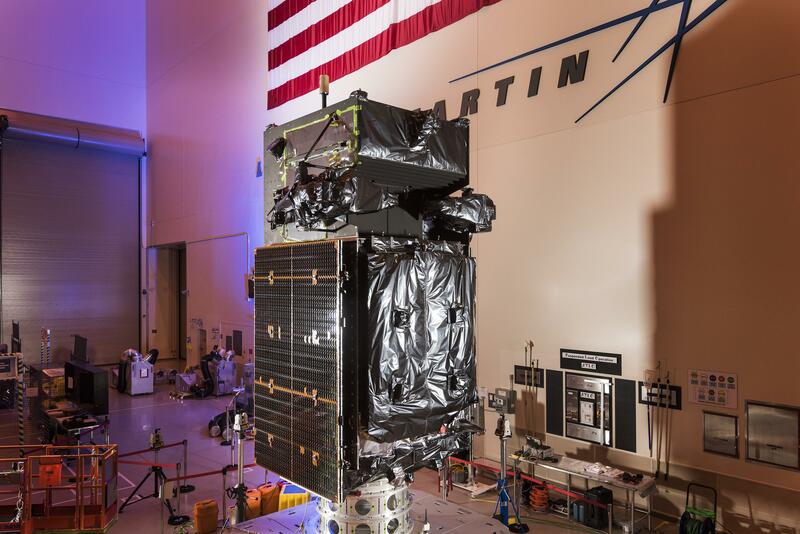 SBIRS comprises dedicated satellites in Geostationary Orbit, hosted payloads operated from Highly Elliptical Orbits to provide coverage in the northern regions, and a completely new, integrated ground segment to distribute information faster than before. In the initial stages of the program, SBIRS satellites join their legacy Defense Support Program counterparts before SBIRS will fully take over once four GEO satellites are operational. SBIRS-GEO 3 will further expand coverage of the SBIRS system, offering a much higher sensitivity and revisit rate than their aging predecessors which will remain active until SBIRS-GEO 4 – launching later this year – will be declared operational to allow SBIRS to cover the entire globe. The sensitivity of SBIRS is paramount when attempting to detect short-burning & short-range missiles that only appear as very brief & dim targets to a satellite in Geostationary Orbit.